Democratic Party hero and legal scholar Alan Dershowitz, a vocal supporter of Hillary Clinton during the 2016 presidential election, is beginning to learn what it feels like when one diverges from the liberal media agenda. The former Harvard Law School professor is finding it hard to get his usual attention from the mainstream media because he doesn’t agree with their prescribed agenda regarding the Trump/Russia witch hunt. Dershowitz said he attempted to reach the opinion page editor and deputy editor without success. He said he wants to “get out in the liberal media” but that his opinion is “not the narrative they’re pushing. Alan Dershowitz’s argument is a danger to the left-wing media agenda because they would have to respect his opinion as he isn’t defending Trump from the Russia attacks because of his own political bias (he is a liberal), but from his knowledge of the Constitution and the Law. As a result, the liberal Alan Dershowitz has been finding a new audience in conservative oriented media. He’s appeared of Fox News presenting his case more than once (most recently on Judge Jeanine’s program to declare that Trump Jr. did nothing illegal) and has even published an op-ed on the Fox News site. Breitbart News, TheBlaze.com, NewsMax and The Washington Times, all right-leaning sites have all either covered a Dershowitz interview and/or interviewed him themselves. 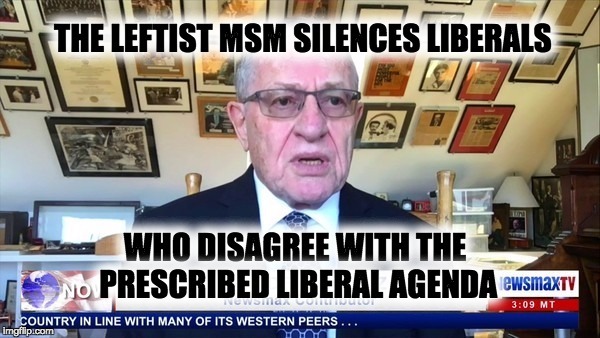 It seems that Alan Dershowitz has run into the liberal mainstream media brick wall. Perhaps now that he realizes that liberal media bias exists, he will talk about it more often.